Amy Plum stole my heart away with Die For Me. 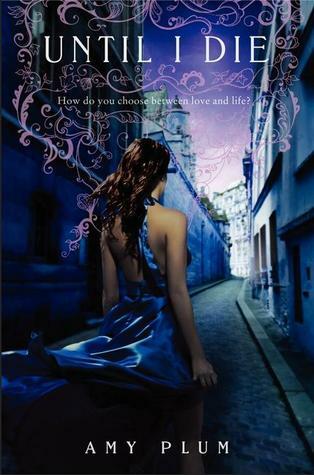 A unique paranormal creature, fabulous romance, adorable side characters, and a Parisian setting. What could better? I was thrilled to pick up the second edition in the Revenant series, Until I Die. Like many second books, most of Until I Die is the eye of the storm, a brief lull between gale force winds. The Revenant world seemed temporarily safe after Kate and Vincent dispatched Lucien, the leading Parisian numa. Now all Vincent has to do is develop his relationship with Kate and try not to die. This is a harder feat than might be expected. Revenants are compelled to sacrifice themselves for others, but Kate can't handle the emotional toll of seeing Vincent die over and over again, particularly after her parents' recent deaths. Part of me is annoyed with Kate for this. If you're going to date a paranormal creature, you should get used to his oddities. For some it may be sucking down bags of blood, while others have the tendency to die and then rise again three days later. But I suppose I can also see how watching the guy you love die horribly again and again would get a bit taxing, even if you know it's only temporary. I still think it's a little selfish on Kate's part though. But then again, Vincent is totally committed to trying to restrict dying. That desire not to die is also the impetus for the ubiquitous emotional/physical distance between the leading characters in the "second book." Vincent doesn't want Kate to know exactly what he's doing, because it's grisly. Despite the use of a second book stereotype, there is no love triangle in this book. Hooray for defying convention at least a little bit! The side characters in the Revenant series continue to be a highlight of the books. Sadly, Charlotte was largely absent in Until I Die. Her Alice-like personality brings color to the pages. Still, there is plenty of Jules as well as Ambrose and Gaspard. I have trouble distinguishing Jules' and Ambrose's personalities. I think Jules is slightly more flirty and I loved every scene in which he appeared. And I adore Gaspard, the sword wielding poet. We also have the addition of Violet and Arthur, 500 year old revenants who arrive in Paris from the chateau to advice the group. Arthur is a brave but dour figure. Violet looks like a little girl, but it smart and calculating. She advises the family about the numa and eagerly takes Kate under her wing, teaching her the symbolic language of flowers. Violet and Arthur were great additions to the series - their personalities are distinguishable from the other characters and they do a great deal to move the plot along. Keeping in the typical second book category, Until I Die is slower than Die For Me. We get to know the characters better and learn a lot of history about the Revenants. For series that I really enjoy, I don't mind a lull in the action, because good character development and world building make the books so much richer. Even if Until I Die dragged occasionally, there was plenty to keep me interested. The action scenes at the end definitely makes up for the earlier slowness. The story ends on a big cliff-hanger. Amy Plum's Revenants series is one of my favorite paranormal romance series. Until I Die lacks a little of the magic of Die For Me, but it pushes the story along and continually held my interest. I can't wait to read the next book! I really love this book. I'm dying to read the last book of the series. Have you seen the cover? I really love it! But I have to agree, Until I Die is just... slower than Die For Me but the whole read was fantastic! Great Review! This one was definitely a bit slower for me as well Alison, well at least until the end (*dies*), but I still enjoyed it overall. It's such an interesting world, and I'm now salivating over the next book wondering what's going to happen. While I loved the Parisan setting, I couldn't get past the creepy paranormal creature part which is what turned me off on the book. I'm glad you enjoyed this one for the most part. I wasn't a huge fan of the first book so I haven't picked this one up... And the cliffhanger tells me to at least wait until the next one comes out. The ending of this one killed me! I can't wait to find out what happens next! The romantic and emotional drama in second books never fails to annoy the crap out of me. I wish they weren't always so formulaic. But I'm glad you still liked this book overall! No love triangle??!! I may read this series then. I always wonder why the other half of a paranormal couple gets uptight too. If you decide you must be with them then their quirks come with the territory.